Daphne Wood lived in Inversgail, on the west coast of the Scottish Highlands, as a child. For many years, she’s been in Canada, living off the grid and preaching ecology. Now she’s come home as artist in residence. Everyone is thrilled—until they meet her. Apparently, living off the grid doesn’t improve one’s social skills. She runs late, fails to show up at all, is blunt and demanding. This whole artist thing might have been a mistake. When a young American tourist is found dead, Daphne decides she’ll be part of an investigative group to solve the murder. She found out that Janet and the other women who own the bookstore have helped find killers in the past. Daphne wants in and spreads rumors that they are on the case. Daphne should have known, poking and prying can get you into big trouble. When she’s found, poisoned, the police determine the poison was in scones from the bookstore’s café. With their reputation on the line, Janet and her friends have to find the killer. There are rumors about a whiskey society, but no one’s talking. Does it have anything to do with the deaths? There seems to be no motive for the American. Daphne, well, anyone who met her might have murderous thoughts. This is book two in the series. Janet and her friends are a thoughtful bunch, not taking risks but willing to ask questions, listen to the answers, spoken and implied, and analyze the results to come to a satisfying conclusion. Janet’s an American so readers get to see the Highlands as she does, a former tourist turned resident. If you’re in need of a getaway, MacRae can transport you to Scotland at the turn of a page. To enter to win a copy of Scones and Scoundrels, simply email KRL at krlcontests@gmail[dot]com by replacing the [dot] with a period, and with the subject line “scones,” or comment on this article. A winner will be chosen March 24, 2018. U.S. residents only. If entering via email please included your mailing address. Sandra Murphy lives in the shadow of the Arch, in the land of blues, booze and shoes—St Louis, Missouri. She writes articles for Animal Wellness and Natural Awakenings magazines and online, for Sniff and Barkens. For the last ten years, she's written/edited the SPAWNews, a monthly newsletter for small publishers, artists, writers network. She has written short stories for three anthologies (Flash and Bang, The Killer Wore Cranberry #4 and Dogs and Dragons). There's even a tale of the pitfalls of gardening when you're six years old, titled Death of a Red Leather Mary Jane. At last, she's achieved her dream of a book of her own on Kindle--and all the other e-readers--with the publication of From Hay to Eternity: Ten Tales of Crime and Deception, a collection of short stories published by Untreed Reads. Her Westie-ish dog, Ozzie, begs you to buy a copy. It's only 99c and he needs more toys. Book sounds good. Would like to read it. Thanks for the chance at the giveaway. Sounds wonderful...and I would love to read it. This sounds so good! Can't wait to read it. 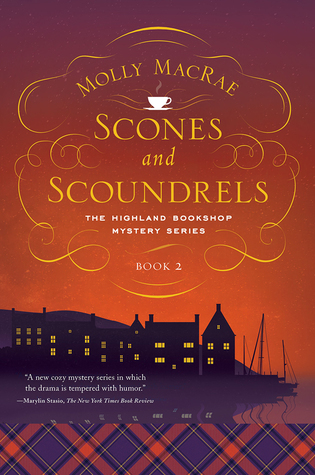 Thank you for the information and your review on “Scones and Scoundrels” By Molly MacRae. Sounds like a book that I'd love the chance to read. Appreciate the chance to win a copy! I can't wait to find out who-done-it. I would love to read this book. Thanks for an opportunity to win a copy. Molly MacRae's books have such great covers! I love all things Scottish, so this sounds like a great book. A good review - thank you Sandra. Molly's books are always great reads! New series to me. Looking forward to reading. Sounds like a great read. Would really like to read.